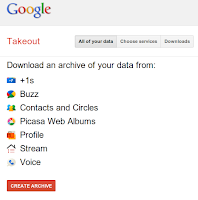 Google has a not at all known service called Google Takeout which can be used to take the data you created or uploaded to various services. You can download these data as zip archive files either all or separately. This option can used once in a while to backup all your data that you keep in Google. I tried my contacts as all the contact groups came as VCF (vCard) files in a zip which you can see below. They also have an engineering team called Data Liberation which co-ordinates between all the engineering teams of Google to give methods to customers to take their data out and their mission statement is "Users should be able to control the data they store in any of Google's products. Our team's goal is to make it easier to move data in and out."